Will the new point of sale legislation in Scotland influence young people’s knowledge and attitudes of tobacco products? Smoking remains one of the most significant public health challenges in Scotland and is implicated in one in every five Scottish deaths. Each year, around 15,000 young Scottish people start smoking and many go on to become regular smokers. Since the introduction of the Tobacco Advertising and Promotion Act in 2005, most forms of tobacco advertising and sponsorship in the UK have been banned. One of the few ways the tobacco industry can legitimately promote their products (often by elaborate and prominent means) is via point of sale (POS) tobacco displays. A recent systematic review showed that POS displays increased children’s susceptibility to smoking, experimentation and initiation into smoking. As part of its Tobacco Control Strategy, the Scottish Government has introduced legislation affecting the display of all tobacco products, prices and smoking related products. The intention is to reduce the attractiveness and availability of tobacco products. 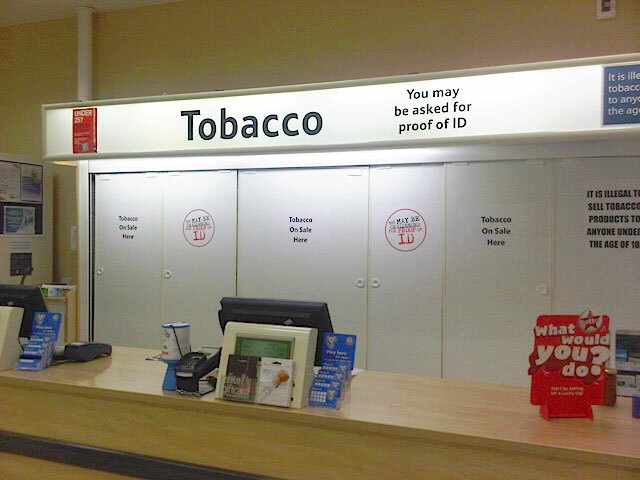 In April 2013, the POS tobacco advertising in large retail outlets (such as supermarkets) was banned in Scotland, and this will be extended to all retail outlets in April 2015. Jamie Pearce and Catherine Tisch from CRESH are part of a multi-disciplinary team which is assessing the impact of the ban of POS tobacco displays and advertising on young people’s exposure to tobacco advertising, their attitudes towards smoking, and ultimately their smoking behaviour (funded by The National Institute for Health Research). Four communities have been selected across Scotland which different in terms of their levels of social deprivation and rurality. completing focus group interviews with samples of school pupils. Baseline data collection began in 2013 and a longitudinal follow-up will continue for four years. We will be examining whether young people’s attitudes to smoking, brand awareness, perceived ease of access to tobacco products and smoking prevalence is affected by the new legislation. These findings will not only be of interest to policymakers in the UK and elsewhere, but will also help to reveal some of the ways in which geographical context can enable or constrain health-related behaviours and practices such as smoking. Further details of the project can be found in our study protocol that has just been published in BMC Public Health. Previous PostSocial differences in pollution across the EU may help to explain health inequalitiesNext PostDoes deindustrialisation explain low levels of physical activity in the UK?